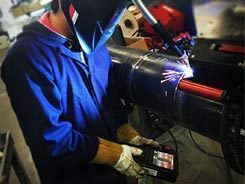 It is crucial that the pipe welding systems used for mechanised welding —with all its necessary ancillary equipment— are well maintained. If multiple welding stations are used they should be set up consistently down to the finest detail. Failing to do so can result in weld inconsistencies and defects and necessitate repairs that otherwise could have been avoided. 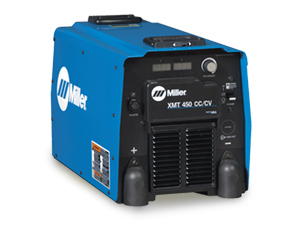 Having the correct replacement parts for the welding equipment —particularly the welding torch— is essential . 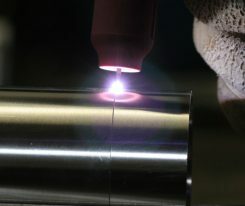 Even the small components in the welding torch can have a significant impact on weld quality. 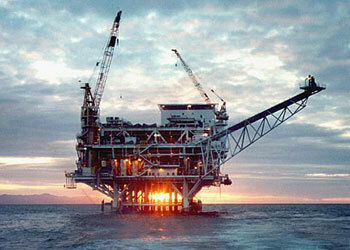 Inferior equipment costs less, but quality will likely suffer, increasing costs in the long run. Selecting the welding process is usually a balancing act between productivity and quality. It is important to have experience with various processes prior to applying them on a job, however equally important is to try new processes and process variations.One of the most common welding processes in use for pipeline welding is GMAW or one of the many variants of it. Typically a lower productivity, low heat input variant is selected for the root and hot-pass portion of the weld and pulsed GMAW process for the fill and cap passes. Also common are GTAW and SAW processes when increased weld quality or higher deposition rates are required. There is a significant difference in process control and attention to detail when welding CRA grades as opposed to C-Mn steel grades. There are specific shielding gas mixtures developed for the various CRA grades to be used in conjunction with GMAW – it is good practice to ask gas suppliers about improved or purpose developed gases. 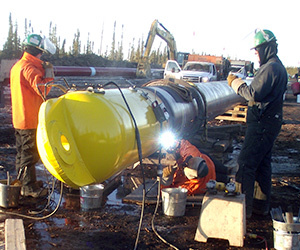 This is also applicable to consumable grades – very often there are process specific grades available for pipeline welding. 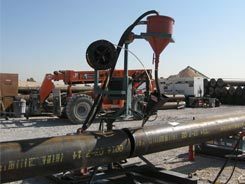 Most pipe prep is currently carried out with the use of some type of automated pipe cutting and beveling equipment. In most applications, a narrow groove preparation is employed with included angles ranging from 0-15 °. Typical feature of this type of weld preparation is the closed gap (no root gap) fit up, where the bevel landing thickness and extension are critical dimensions in controlling root penetration and quality. 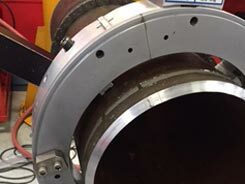 The accuracy and consistency of the dimensions achieved in the weld bevels in the root area greatly influences the consistency of the weld root quality and profile achieved. You should give as much consideration to the preparation as you do to the actual welding. Consistent, high quality pipe end preparation will result in improved productivity and lower weld defect rates, particularly in the critical root area of the weld. 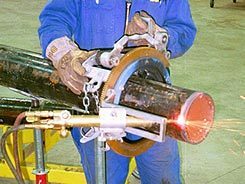 Red-D-Arc supplies a wide variety of pipe welding and induction heating equipment suitable for pipeline and pipe fabrication work. Renting allows you to keep your business current with the latest equipment while avoiding large capital costs. Additionally, renting ensures that your equipment is always maintained to the highest possible standards by experienced technicians, and can be replaced immediately in the event of failure so that down time is minimized. Ask one of our experts to find the best fit for your application. We’ll provide the expert advice you need with regards to equipment selection, financing options, employee training and ongoing support.